Poems by Sarah Lantz. Chine colle etchings by Sarah Horowitz. Remembrance by Eleanor Wilner. 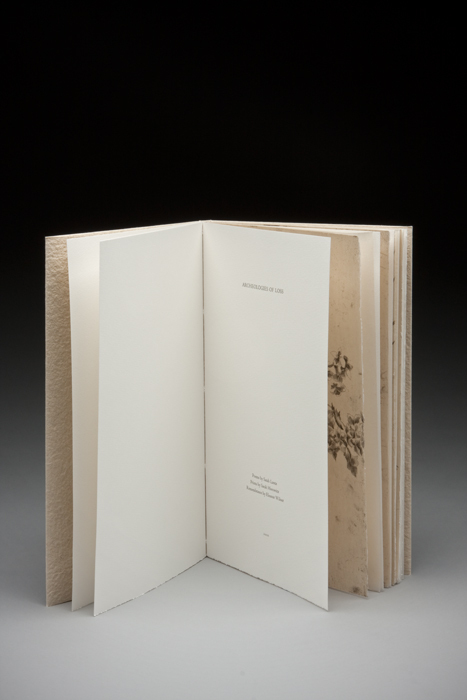 Book is SOLD OUT; individual etchings available. In Archeologies of Loss, the persistent conversation between the poems and the etchings conveys their shared temporal quality. Archeologies deals with collective memories, their loss and disintegration but also their rediscovery and unearthing through individual histories- those of Sarah Lantz and her poems. Lantz, who passed away suddenly in September 2007 just after the publication of her first book, explores themes of the passing of time, absence, deterioration and loss in her poems. She muses, “How ludicrous we are,/ one moment a conjunction/ of trembling, the next/ the light, though light/ cannot reside anywhere/ nor the endings be always happy.” She weaves into it both personal moments and of conflict, specifically the lost world of Europe's Jews, reclaiming an identity with a community of loss. My images, primarily through plants, elicit ephemerality— their growth, decay and dispersal of seed, eventually disintegrating to leave only the fibrous skeleton. I hope to capture a lightness, a sense of space, in spite of the ever-present fragility and mortality, reflected in my memories of desert winter landscapes—golden sun-bleached grass, charcoal woody stems and white snow. Seven poems by the late writer Sarah Lantz were reproduced from her book Far Beyond Triage with permission from Calyx Books and her family. Eleanor Wilner wrote the remembrance for this collaboration of words and images in memory of Sarah Lantz. Ten etchings were drawn, etched and printed by Sarah Horowitz on handmade Japanese gampi paper. The Centaur types were cast by Michael & Winifred Bixler and printed on Somerset satin wove paper by Art Larson of Horton Tank Graphics in Hadley, Massachusetts. 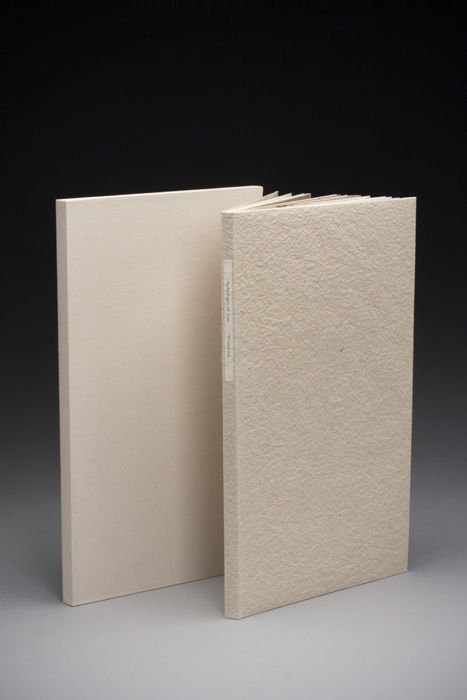 Julia Weese-Young boxed and bound the book in Cave Paper flax at her home in St. Louis, Missouri. Archeologies of Loss was designed and produced by Sarah Horowitz of Wiesedruck in Portland, Oregon. The edition is twenty-five with proofs for the collaborators. 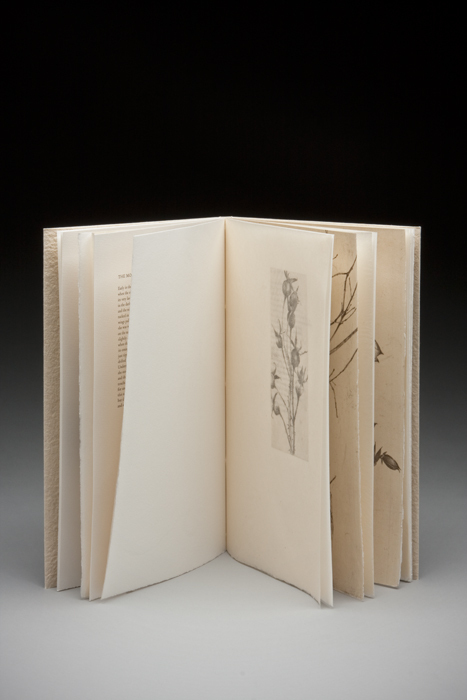 An additional set of individual etchings has been printed in an edition of twelve.